With the FDA’s Case for Quality sharpening the focus on medical device sustainability, safety, and patient outcomes, manufacturers can benefit from understanding the quality measures that apply to metal stampings. 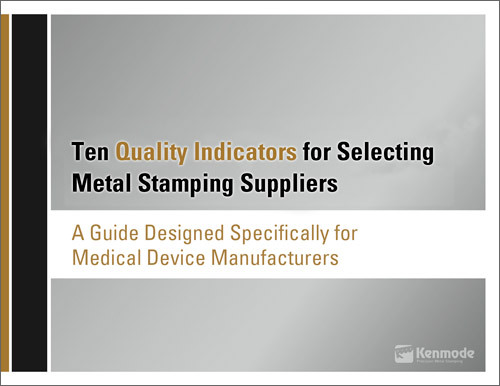 This eBook is designed specifically for medical device manufacturers to help them evaluate metal stamping supplier quality based on ten quality indicators. The eBook incorporates the findings of the FDA’s groundbreaking report, Understanding Barriers to Medical Device Quality, as they relate to metal stamping quality and the long-term performance and reliability of medical devices and their components. Complete the form to download Kenmode's free eBook "Ten Quality Indicators for Selecting Metal Stamping Suppliers,"